Red rock crabs are native to the Pacific Ocean. They range from Alaska to southern California. They live in rock, gravel or kelp beds in bays, estuaries and rocky areas of the ocean from the low intertidal to at least 90 metres depth - although they have been caught in traps as deep as 230 metres. 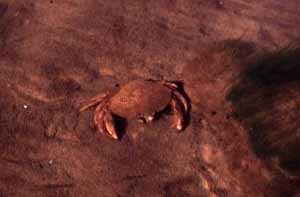 Red rock crabs often shelter in rocks or bury themselves in the sand to avoid predators such as river otters, sea otters, large fish and other crabs. Adult red rock crabs are a dark, brick red colour with a white underside. They have a wide carapace that is quite smooth to the touch and two large claws of equal size with black tips. Red rock crabs may attain shell widths of 160 millimetres across the shell but are generally smaller than dungeness crabs. The legal harvest width in British Columbia is 115 millimetres across the widest part of the shell. Females are smaller, seldom exceeding 100 millimetres carapace width. Juveniles look strikingly different from adults-they are cryptically camouflaged and may be white or red with white stripes. Red rock crab usually measures less than six inches across the back and has large claws. It can be distinguished from the Dungeness by its black-tipped claws and its red color. 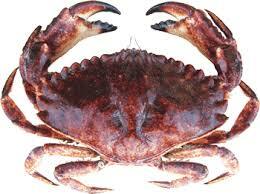 Although it is less meaty than the Dungeness, red rock crab meat is tasty. The red rock crab also prefers rocky areas, as its name implies. Crab pots are crab traps commonly used to catch Red Rock crab in BC and can be bought or made. They are constructed by wrapping netting or wire mesh over an iron frame in which one or two funnel-shaped openings, called tunnels, are provided for crab to enter. Rapid exit from the pot is prevented by a 'trigger' device. Crab pots are generally baited with chicken, fish carcasses, salmon heads, or other meat, then set in water 20-150 feet deep (they must be placed below the lowest tide line) and located by the line buoy. Sport crabbers must attach red and white marker buoys. These must be legibly and permanently marked with the operator's first name, last name and address. Buoy lines must be weighted sufficiently to prevent them from floating on the surface. Ring nets are baskets made from two iron hoops and cotton or nylon mesh. When lowered to the bottom, both rings lie flat to permit crabs quick access to the bait that is tied to the bottom meshes. When the ring net is hauled rapidly to the surface it forms a basket in which the crabs are momentarily trapped. These nets are tended frequently, about every 15 to 30 minutes. Ring nets can be used from boats, docks, piers and jetties. We hope that the information provided on this page makes you a better crab angler. In case you’d still like to continue your research into crab fishing we put together the below list of resources. They should be sufficient for expanding your knowledge base. How to Catch Crabs - There is nothing quite like a harvest of freshly caught crabs to set the tone for a perfect shoreline feast. Charlie White shows how beginners and veteran crabbers alike can benefit from his decades of experience—from finding and capturing crabs to storing, cleaning, and cooking your catch. Whether you use crab traps or the traditional shoreline, low-tide hunt to bag your quota, this book will aid your cause. Red Rock Crab – Wikipedia – Learn more about red rock crabs on Wikipedia.